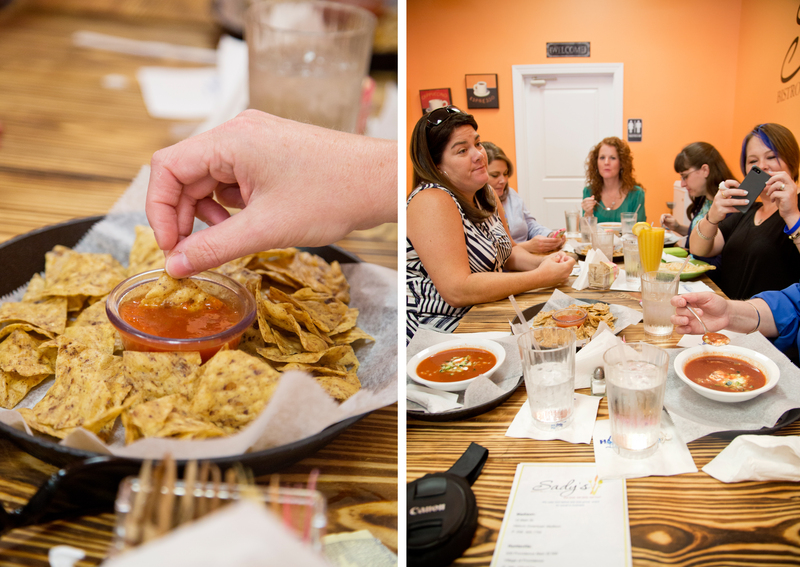 So, recently I was asked to be part of a food blog tour for Alabama’s Restaurant Week. I would travel to three separate restaurants with fellow food bloggers, eat, socialize and write about my experiences. Yes, please! Can we have an Alabama Restaurant Year, because I am all for that? 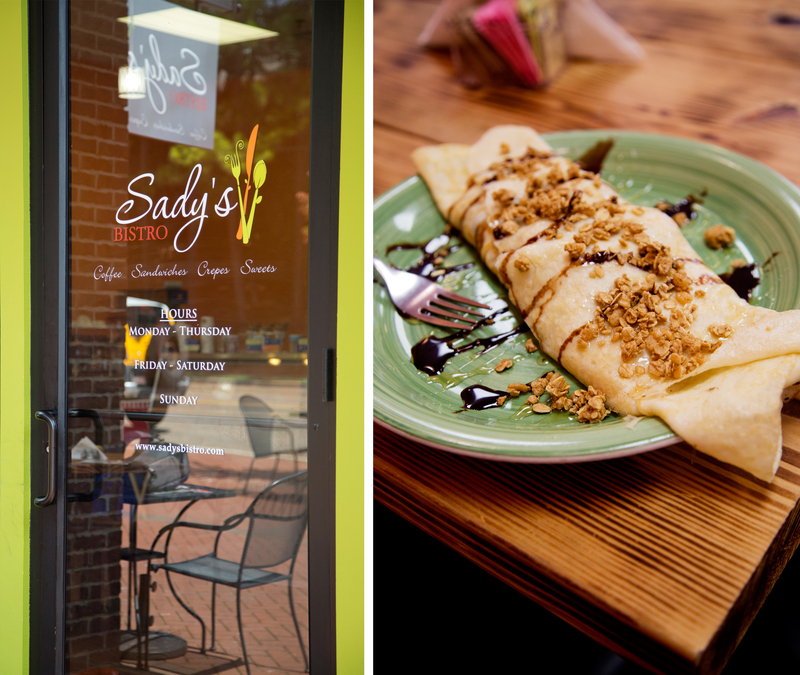 The first restaurant on the tour was Sady’s Bistro, which specializes in fresh sandwiches, soups, crepes and much more. I’ve been there before, but I got confused about the location, so I parked super far away thinking I was actually quite close. As I exited my car, I did a last-minute re-apply of lipstick, hair check (looking pretty good) and started walking in the humid, Alabama heat to the restaurant. When I realized I was much farther than expected I picked up my speed to make it on time, and as I was entering the building I remembered that I left my camera in the car. I now was sprinting back to the car (why did I wear these freakin’, uncomfortable shoes?) and could feel the sweat dripping down my face and my hair going rogue on me. On the route back I cut through a small field, tripped in a hole and made it to the restaurant, out of breath, covered in sweat and grass with everyone waiting on me. I’d like to say this not typical of me, but that would just be a lie. On the right is a Mango Lemonade, which I didn’t try but looked wonderful. Despite my disheveled state, I was able to get seated and start meeting my fellow bloggers. They are all super talented and super nice and I was kept quite entertained by Bo, Christie, Constance and Paula, who were on my end of the table. We chatted and ate for TWO hours and I realized that this is the only way to do lunch. 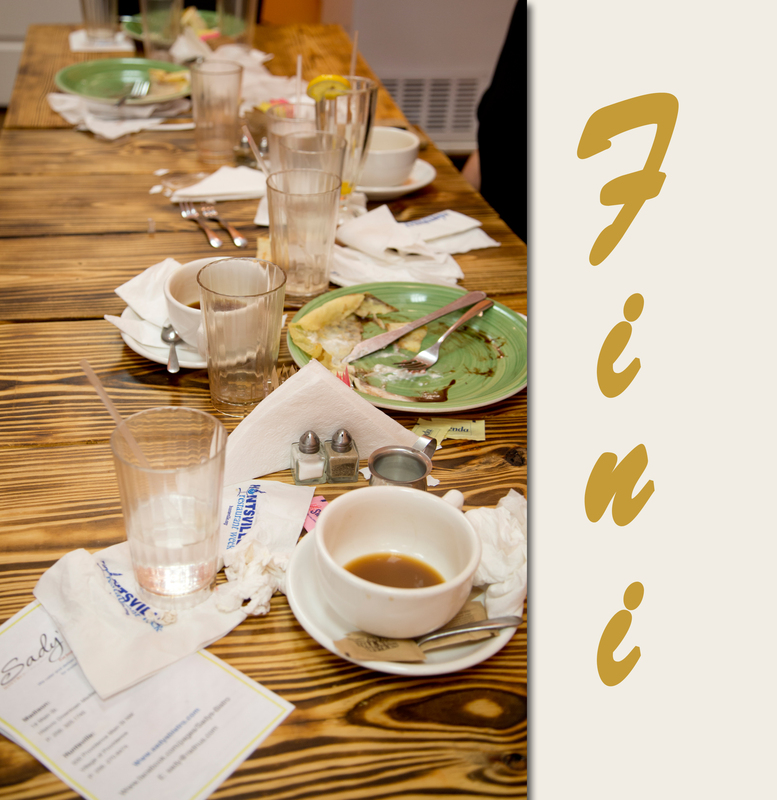 Food, stories and ideas were all shared around the table and I was both enriched and rejuvenated by it. So often we get into a frantic pace of life and find ourselves eating fast food in the car thinking about our multitude of chores, rather than sitting down to a healthy meal, having a moment of joy and gaining a new perspective on life. Please check out the blogs posts of my fellow bloggers. As I said, they are all talented and each blog will offer a different perspective of the experience. We ordered our food, most of us opting for the restaurant week specials, which was $15 for a fresh soup or salad, a choice of entrée (either crepes or taquitos) AND a dessert. Such a deal. On recommendation of the super wonderful server (whom I’m sorry I don’t remember her name) I got the tomato soup with rosemary bread and then went straight for dessert with Crepes de Yogurt, drizzled with honey, chocolate and granola. It was all wonderful. 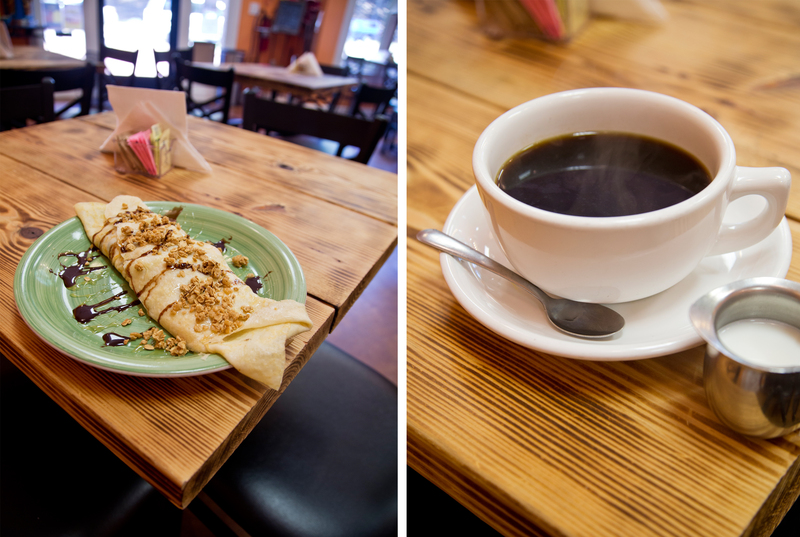 I finished off with a giant cup of coffee because I have a pretty bad caffeine addiction. The first step is admitting you have a problem. Step 1 done. The staff was lovely, the food was tasty and the restaurant was a nice bright location with cheerful decor, so top stars for everything. 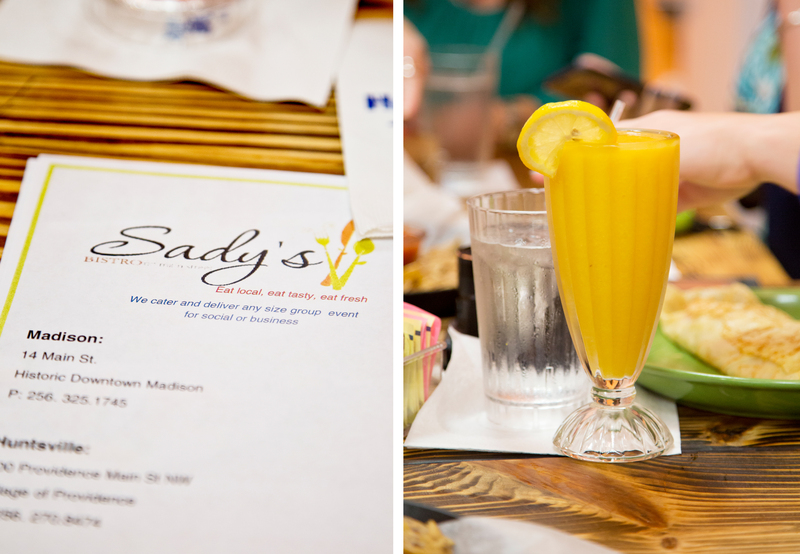 I highly recommend giving Sady’s a try, and thank-you to the Huntsville-Madison County Convention & Visitors Bureau for giving me the opportunity to participate in the blog tour. 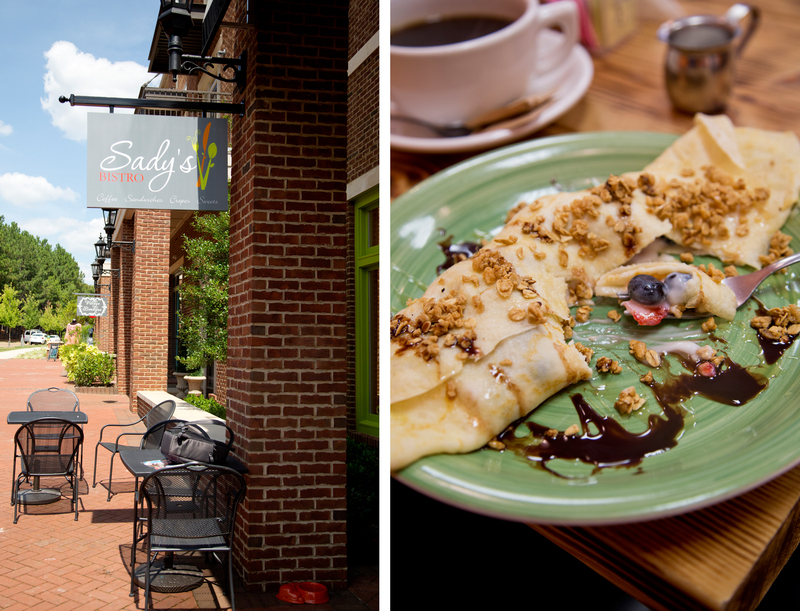 Categories: Food Review | Tags: #dineHSV, alabama, alabama restaurant week, Crepes, eat local, fresh food, huntsville, Huntsville restaurant week, local food, Sady's Bistro | Permalink. Thank-you for serving us amazing food. I LOVED doing the tour. 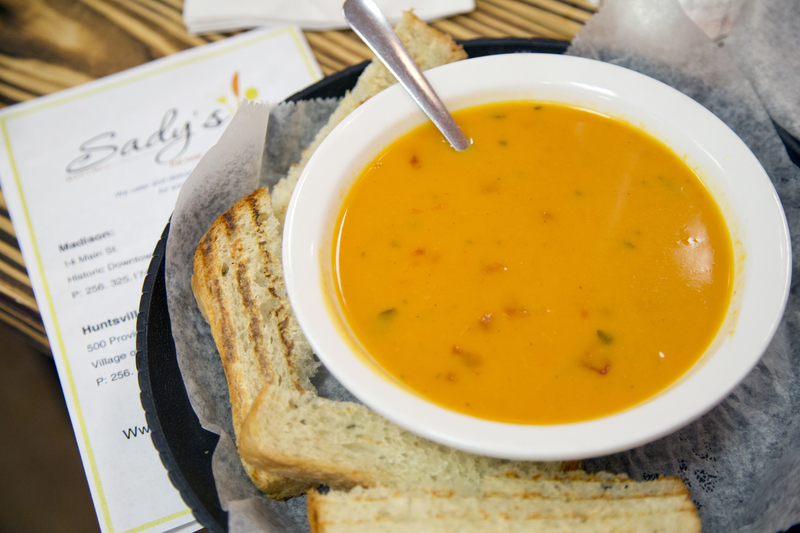 I will be back to Sady’s very soon.